Operational delays at Cheniere's Sabine Pass LNG facility had investors a bit nervous this past month. 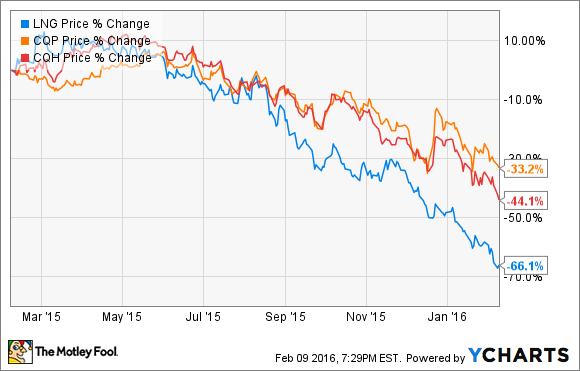 What: Shares of Cheniere Energy (NYSEMKT:LNG) fell 19% in January. While the entire market for energy stocks was less than robust for the month, Cheniere was hit particularly hard when it announced that it had to delay its first cargoes of LNG a few months. Similarly, shares of its two subsidiaries Cheniere Energy Partners (NYSEMKT:CQP) and Cheniere Energy Partners Holdings (NYSEMKT:CQH) fell 9% and 14% in January, respectively. So what: For almost all of Cheniere's 20 years as a public company, it has been an idea investment. First it was the idea of producing oil & gas, then the idea of importing LNG, then the idea of exporting LNG thanks to the glut of nautral gas from shale. Now, after years of permits and construction we are about to see what Cheniere Energy looks like as an investment with working operations. It's not getting off to a good start. The company announced back on Jan. 14 that the first cargoes from the Sabine Pass facility will be delayed by two months because of instrumentation and wiring issues at the facility. Management says that it is working with the construction firm to get the issue resolved, and the complete ramp up of the facility remains on schedule. However, as the company has seen its shares declined more than 66% over the past year, investors are probably on the edge about whether to hang onto this stock in the first place. So any news that operations aren't going swimmingly is going to make people nervous. Now what: Investing in Cheniere Energy before now has been a bet that LNG exports from the U.S. will be a profitable venture, but to be profitable the company will need to be a proficient operator. Any major construction project is going to run into speed bumps like this, so investors probably shouldn't freak out too much now. However, it operational hiccups become the norm, then the idea investment Cheniere once was won't turn out to be as lucrative as we once thought.